My name is Misty and I live in Central California. My family and I bought our dream home almost a year ago, a fixer that we've been working hard on to make our own. My job that pays the bills right now is Massage Therapist, but I also write, do photography, arts and crafts, and anything else that sounds fun. I am an avid runner and have run several half marathons and am currently in pre-training for my first full marathon this November. 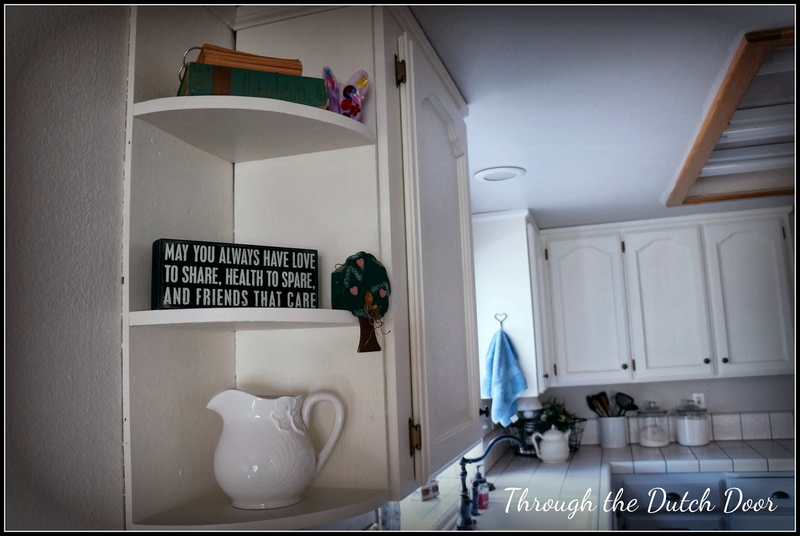 I started Through the Dutch Door to document our journey from house to home. 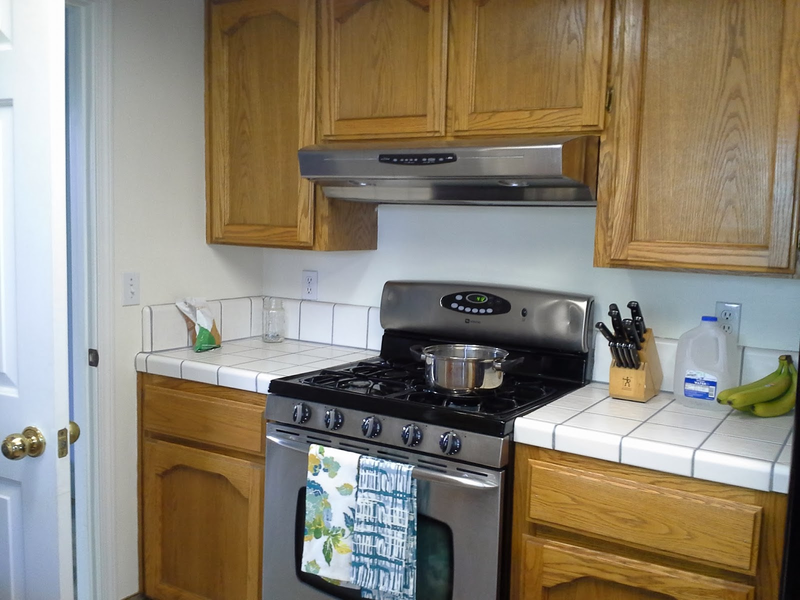 This kitchen has been a trial and error from the beginning. 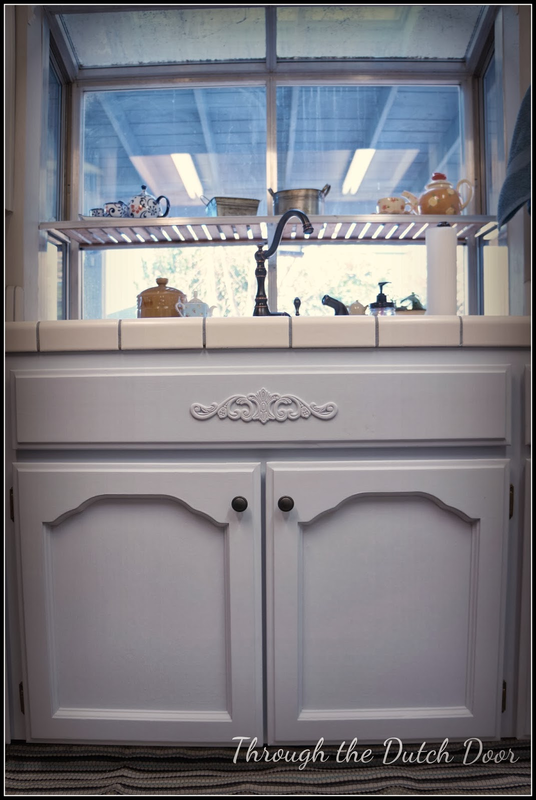 I was afraid to start any projects on the kitchen because I knew it would be a big deal. I just had no idea how big it would be. I started off wanting to do a blue kitchen. I had come across this gorgeous blue cottage kitchen from Cottage4C and I knew I had to have it. 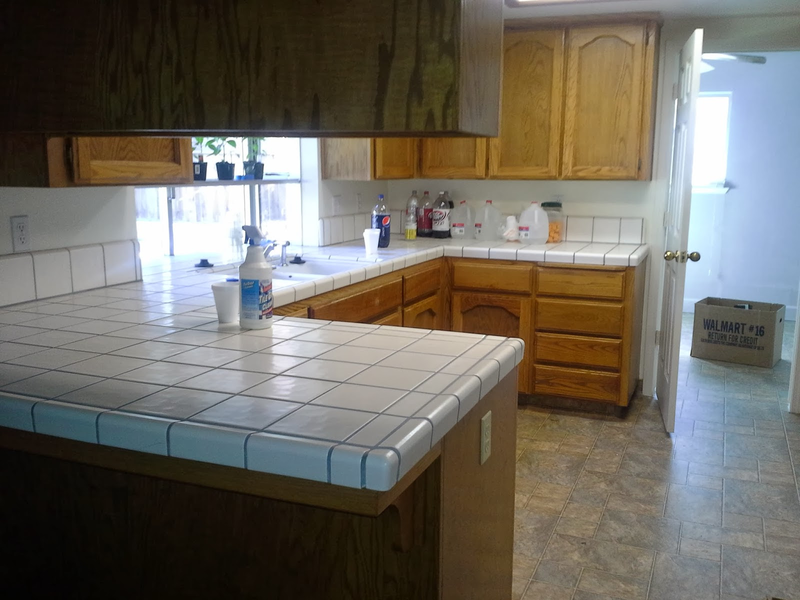 Here is what our kitchen looked like when we moved in. I also figured that the only way to achieve this look was from chalk paint. Let's forget this happened shall we? After getting about 85% done with chalk paint, I realized I hated everything about it. 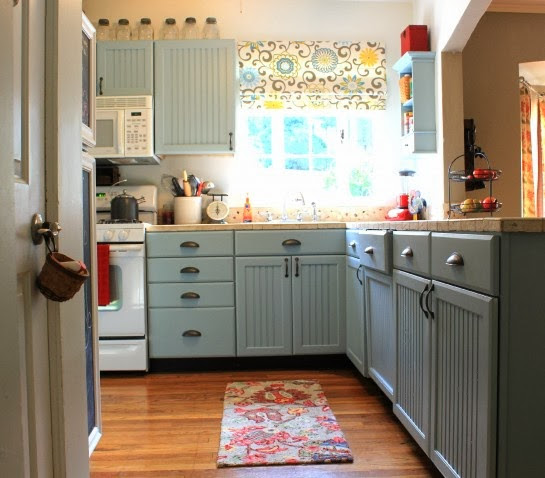 I hated the color, which was Paris Grey, not this beautiful robin's egg blue that was in the kitchen picture. 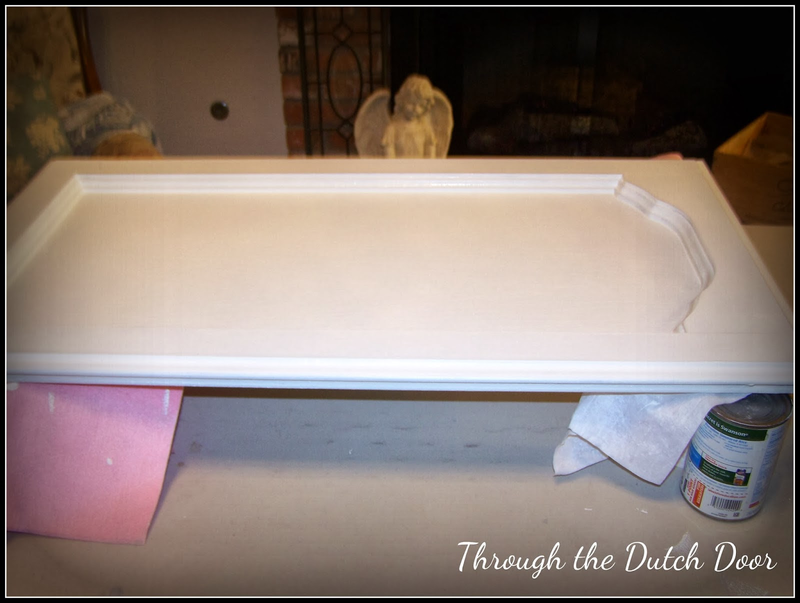 I hated the feel and look of the chalk paint which came out thick and streaky. I hated that it took me twice the amount of paint that the Annie Sloan stockist told me it would, and I still needed more paint. I hated that it took me a whole day to wax the darn thing and when I tried to antique it with the dark wax, it just came out looking like somebody smeared poo all over the walls (sorry, bad visual). Not a good look for a kitchen. Oh, and when I took a rag to it, it immediately would rub off. So I had it in my mind that I would have to strip the entire kitchen and start fresh. After awhile, I decided I would just clean the wax off of them, and paint over the chalk paint. I had decided on doing a two tone, light on top, blue on the bottom. 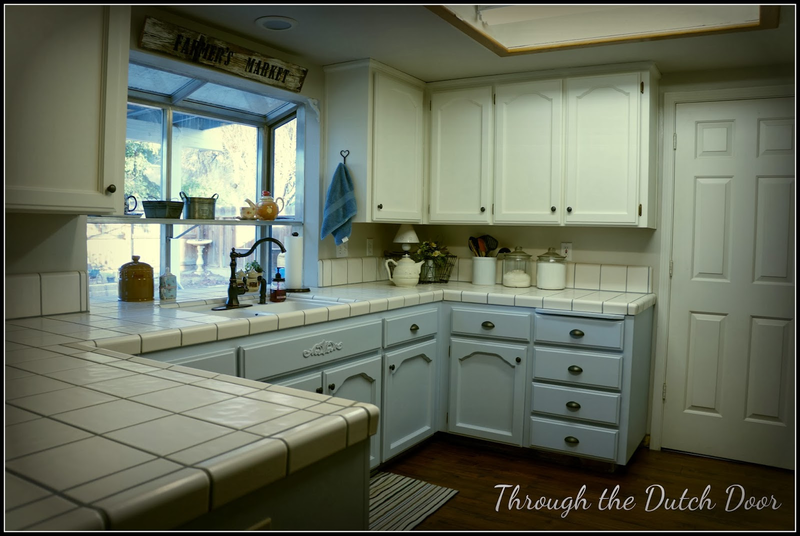 I just could not commit to an entire kitchen of blue and after the mishap with the chalk paint, I was scared to do anything at this point. I chose a Martha Stewart color called Glass of Milk for the top. Fancy way of saying creamy white. I took down two doors and started with that. I was determined to take my time and not rush it. I used Gold Canyon Candle wax remover and it slipped that wax right off. Then I used some Awesome spray, available at the Dollar Tree, to clean any grease or grime. And what to my surprise? The chalk paint just came right off. I did try to sand it for awhile but found that wiping it off with Awesome spray would take it right off. 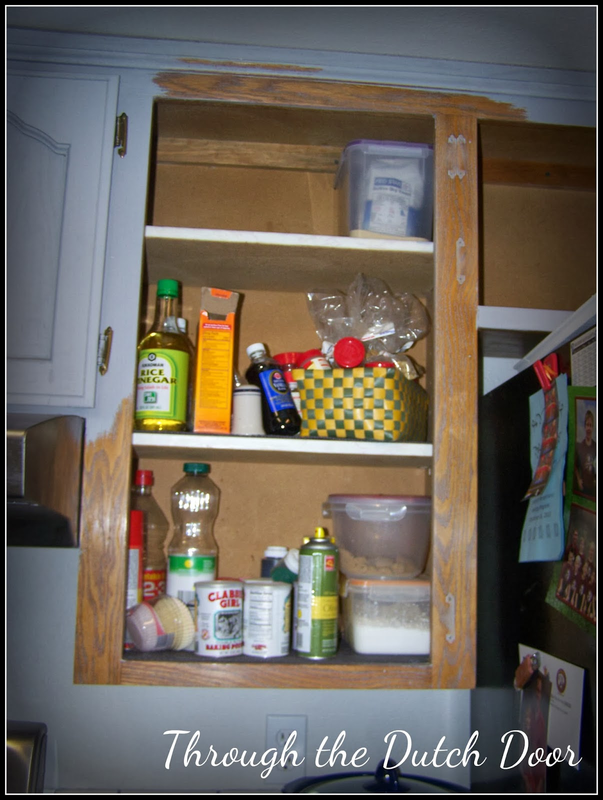 I did this until the cabinets were back to where we started, light oak. Next I used a sponge roller and a sponge wedge brush. I did the backs first, then flipped over and did the fronts, starting with the recessed areas. The paint turned out so creamy and smooth. I love it! After about a week and a half, I was sick of wiping off chalk paint. My hands were dry and cracking from the chemicals, everything was a mess. When you wipe off the chalk paint with Awesome, it makes the paint back to its original liquid state, so then I had to clean that off, of everything! So I tried on one door and discovered that I could paint directly over the chalk paint, minus the was, and still come out with an ultra smooth finish. And because the chalk paint worked as a primer, I didn't use as much of the Glass of Milk that I had before. Once the top cabinets were done, I started on the bottom. 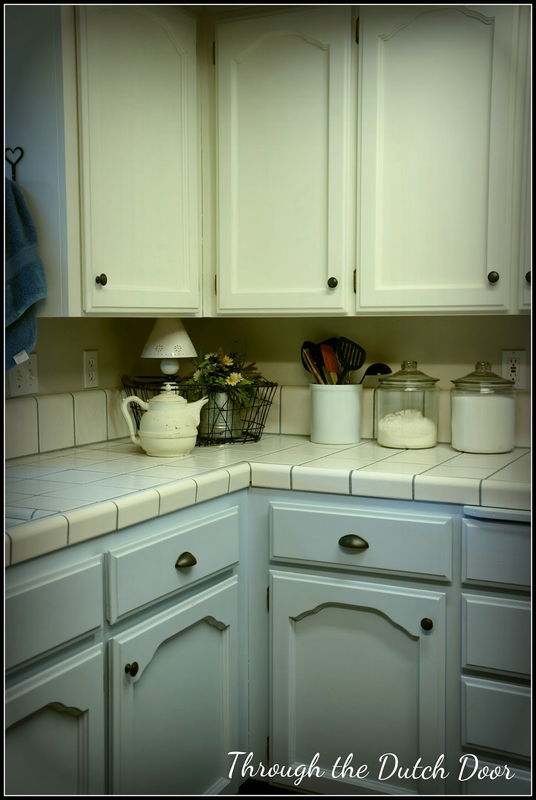 For the bottom cabinets, I used Behr Misty Surf. I bought the primer/paint in one. Overall, I like Behr much better and it went on so much thicker, so it took only 2.5 coats. I used an entire gallon of the Glass of Milk for the top and only about 1/3 of the Misty Surf. Overall, this project took me about three weeks, as I wanted it to be done right. 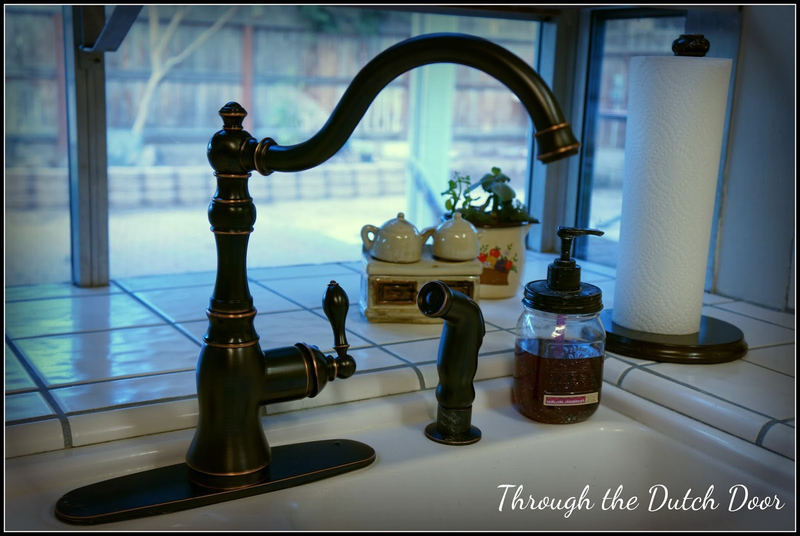 I added some hardware, a little towel hook, a new paper towel holder, a couple of details and we're stamping Done on this project! Here is our finished kitchen! I love it! Quite the transformation, right? What do you think? I'd love to hear your comments! 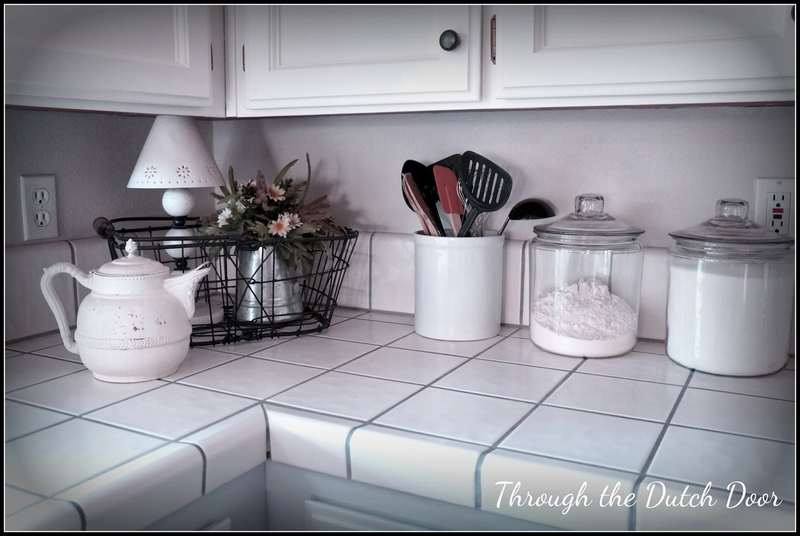 Thanks to Misty for being such a great guest blogger and for sharing this fab kitchen makeover! We think all the hard work was definitely worth it! I love it! So glad you powered through, it turned out great. Thank you! It has definitely been a labor of love, but I am really happy with how it has turned out as well! Wow ... I'd love it too. What an amazing transformation. Your hard work certainly paid off and now you can sit back, show it off and enjoy it! What an impressive transformation. It looks wonderful. Wow! Wow! Wow! What a fantastic transformation . 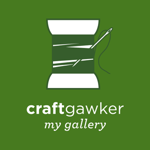 I was really interested to hear your experience with the chalk paint . I've been tempted to try it but really feel like its not very hard wearing. Well done on your super fantastic makeover - the colour choices are fantastic and you made a great call on painting it 1/2 blue & 1/2 creamy white. It was worth all the hard work - you should be very proud of yourself ! Thank you! From this experience I can say that I am not a fan of chalk paint. I achieved the same creamy look from using regular paint. It also saved a step from not having to wax it! It looks amazing, and I really do like the light blue on the bottom! It's so nice to hear someone being honest about the Annie Sloan paint. I've never tried it, but it sounded a bit too good to be true with the "no pre-sanding required." Plus, it is so expensive to use for an entire kitchen. Yes, Carol,you are right, too good to be true and VERY expensive. I was originally told one, maybe two quarts of AS chalk paint, but it took 2 and still there wasn't enough. Crazy expensive! 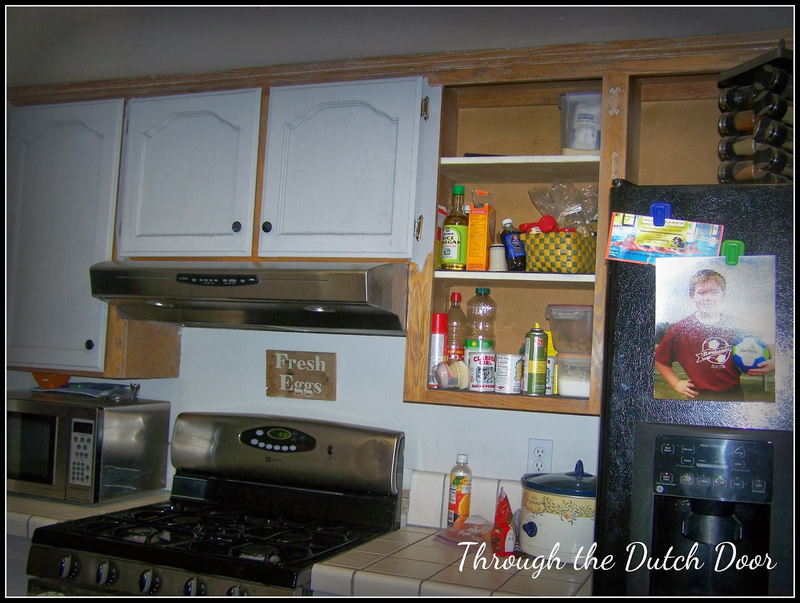 We painted our kitchen cabinets last summer and love the difference it made! 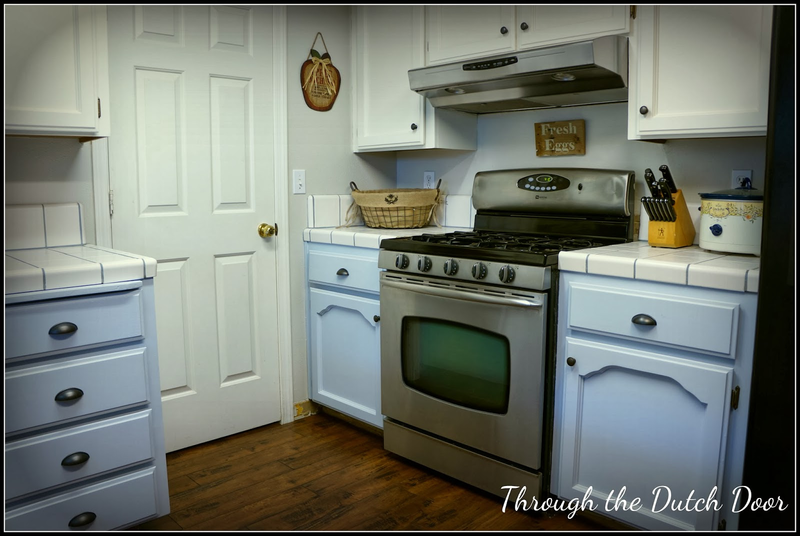 This kitchen looks so much brighter and full of life! Thanks for sharing this at Frugal Crafty Home! I love the fresh look! 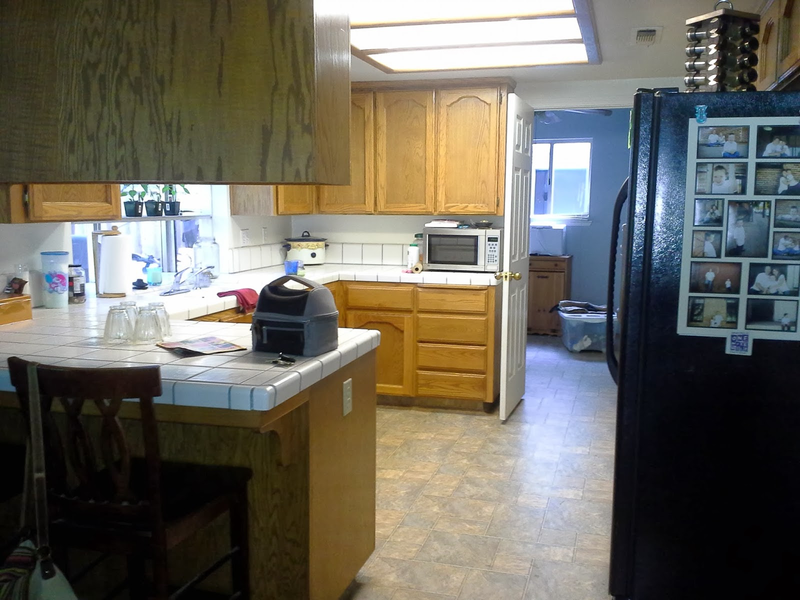 Our kitchen needs a bit of updating, and I've been debating what to do. 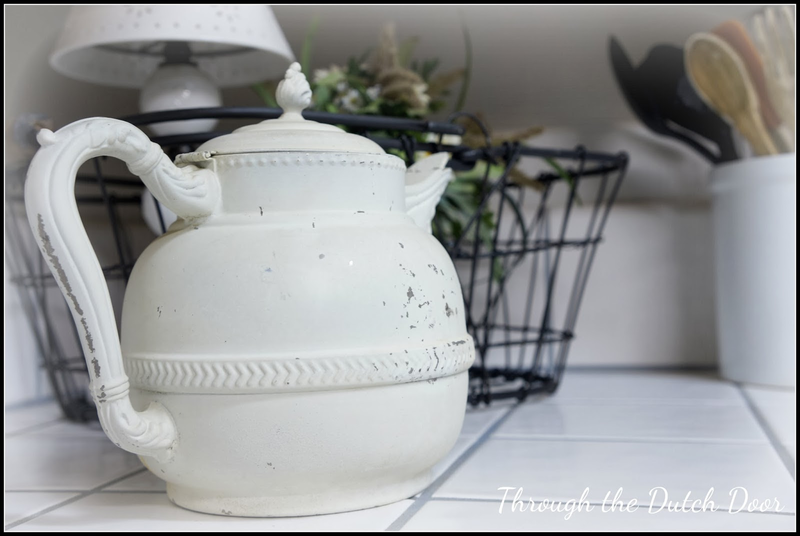 Thanks for sharing at Fabulously Frugal Thursday.